Mother’s Day is fast approaching, but that doesn’t have to mean giving mom just another basket of flowers or a phone call (not that she’d mind either or both). 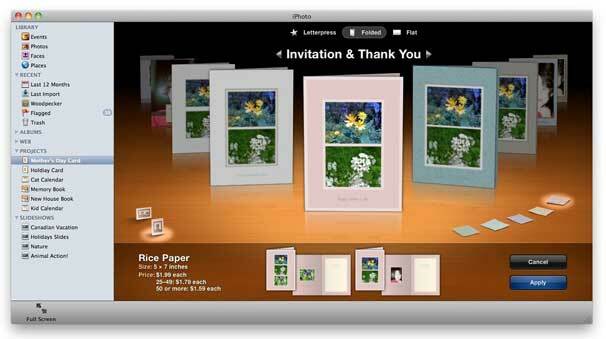 With iPhoto ’11, you can design a beautiful and memorable custom card to accompany your other heartfelt messages. Here’s how. The first step is picking photos. You know your mom, so choose pictures with maximum appeal (for me, that means flowers and a baby picture of yours truly). You can select a single picture in your iPhoto library, or you can build a card by selecting multiple pictures, an event, album, or even a Faces collection of pictures. After I was satisfied with my photographs, I created a new photo album by selecting File -> New -> Album, and dragged in a handful of additional appropriate pictures to have several options in easy reach. Select the pictures (or album or event) you want to use, then choose File -> New -> Card, or click Create in the toolbar at the bottom of iPhoto’s window and choose Card to get started. The iPhoto interface will be replaced by a workspace where you can choose a card and customize its design. You can print two types of iPhoto cards at home: folded and flat (letterpress cards must be printed by Apple). Choose your card by clicking the buttons at the top of the new screen. Cards are organized into different categories. The default view shows all categories, but you can move among them by clicking the arrows beside the category name at the top of the window. Within each category (Baby & Kids, Formal & Wedding, Holidays, Invitation & Thank You) are several themes. To browse them, click one to select it or swipe your Magic Mouse or trackpad to quickly move through your options. Some are festive, others formal, but most are simple enough to make elegant cards for Mother’s Day (unfortunately, there are no Mother’s Day-specific cards in the Holidays category). In the last iPhoto update, Apple added new card themes to the flat and folded collections (but not the Letterpress set), so check Software Update to make sure you’re running version 9.1.2 or better. No matter which template you choose, you can pick a horizontal or vertical layout and a range of color options. To select them, click the swatch and layout icons below the card themes in each category. The selected card updates automatically. When you’re ready to start working, click the blue Create button at the bottom of the window. Note that your card will be saved in iPhoto’s Sidebar under Projects. You can edit its default name by double-clicking it and typing your own title. 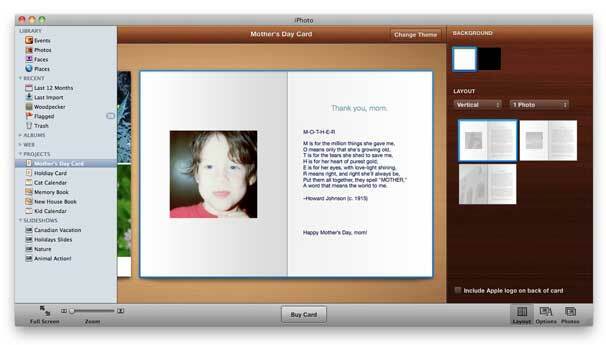 iPhoto '11 lacks a Mother's Day-specific card, but its many themes help you create your own. A new view shows your card’s cover and interior. Here you can click the placeholder text and your pictures to fine-tune your message and access basic editing tools. With them you can change your text’s font, size, alignment, and more. You can also click a photo to drag or use the slider to zoom and focus on what’s important in the shot. To change your card’s layout, select a page by clicking near the edges of the card, then click the resulting menu to choose a new design. You can select pages with photo-heavy layouts by clicking a picture on the page, then clicking on the wooden backdrop behind your card. Note that layout options vary depending on the theme you’ve picked. You can change the card's theme at any point by clicking the Change Theme button at the top of the window. For even more options, select an element and click the Layout, Options, or Photos buttons at the bottom of the window. The resulting sidebar lets you access additional photos you’ve selected for use in your card, and you can even apply simple color effects such as sepia, antique, or black and white to your photos. The formatting sidebar lets you edit features, like removing the default Apple logo from the back of your card. With your card selected in the sidebar, select File -> Print. In the Print window, select your paper size and set your print options. You’ll probably want to skip plain-old inkjet paper and use the heaviest card stock your printer supports, so check your manual. To save a digital file of your card to print at your local copy shop, select the PDF button, choose Save As PDF, then save the file to your Mac. Once your card is finished, make a quick trip to the Post Office, then pat yourself on the back. With some work and your Mac, you’ve made this Mother’s Day a little more special. Now just don’t forget the flowers and that phone call.